The International Year of Light and Light-based Technologies 2015 (IYL 2015) is a celebration of the role that light and light-based technologies have played in global development. Astronomy and the scientific study of light, represented by the International Astronomical Union (IAU)-supported Cosmic Light component, have of course made major contributions. It was the feeble light from thousands of far-away stars and galaxies that probably sparked some of our earliest curiosity in the natural world. Over the centuries, our pursuit of light literally served as a beacon, as curiosity drove scientific understanding and ushered in technological, social and economic progress. For a long time, Astronomy propelled technological innovations that improved our scientific capabilities and went hand in hand with development. Today, Astronomy continues to engage and inspire every new generation. By virtue of its nature, Astronomy holds a privileged position. It can stoke curiosity, spur innovation, and inspire the next generation of scientists and engineers. But can it still drive broader societal development? Can Astronomy still make the world a better place? Pheneas Nkundabakura country coordinator in Rwanda for Dark Skies Africa. Credit: Dark Skies Africa. That was the question the IAU sought to answer when it created a decadal strategic plan to utilize Astronomy as a tool to stimulate sustainable development. To execute this plan, the Office of Astronomy for Development (OAD) was set up in partnership between the South African National Research Foundation and the IAU. The OAD’s primary role is to implement the “Astronomy for Development’ charter globally. It performs this function via three Task Forces, targeted at different groups- i)Task Force 1: Universities and Research ii)Task Force 2: Children and Schools and iii) Task Force 3: Public Outreach. Every year, under the 3 task forces, the OAD facilitates and funds projects that use Astronomy to address a challenge related to sustainable development. These could be workshops that use Astronomy concepts to impart skills in programming or Mathematics, training sessions for human capacity development, collaboration programs, outreach campaigns, or any number of other projects that target sustainable development. Since 2012, 68 projects have been funded globally by the OAD, in addition to many more projects run by its Cape Town office. One funded project that is relevant to IYL 2015 is the ‘Dark Skies Outreach to Sub-Saharan Africa’ led by Dr. Connie Walker. A National Optical Astronomy Observatory (NOAO) developed project, it implemented the successful GLOBE at Night and Dark Sky Rangers programs, an international citizen-science campaign to raise public awareness of the impact of light pollution, in 12 African countries. The goals were to ‘help students identify wasteful and inefficient lighting and provide ways to reduce consumption and to keep energy costs in check’. 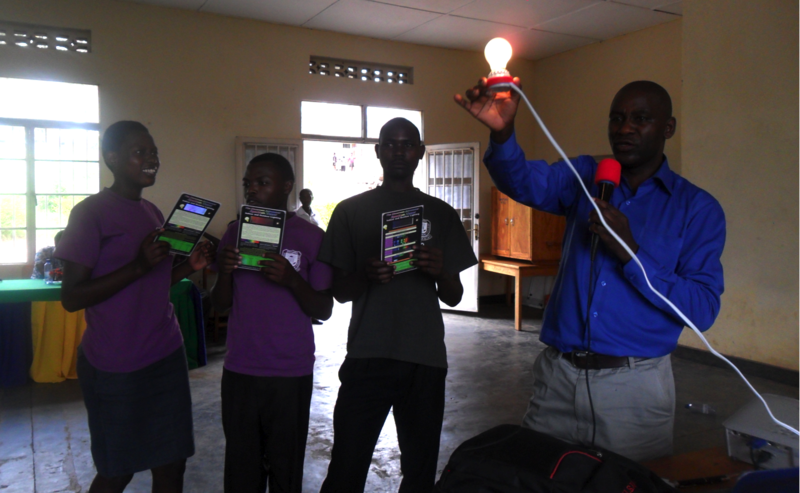 The NOAO designed and produced kits that contained activities related to energy conservation and responsible lighting. These were sent to coordinators in the 12 countries who were then trained via several Google hangout sessions. These coordinators in turn trained teachers in local schools thus disseminating the ideas across the community. The project brought awareness of light pollution, inspired the community to fix the problem by supplying essential tools and methods, and ended up creating an international network working together. It is, in principle, also sustainable as the coordinators could train more individuals without requiring much external assistance. Responsible lighting goes beyond safeguarding dark skies as light pollution affects our health, wildlife, and energy demands. Astronomy merely served as a useful tool to bring the problem into focus. A cornerstone of the OAD’s modus operandi is the emphasis on impact and evaluation. We would ideally want projects to run evaluations and scientifically measure the impact of their work. This would help identify and create a suite of best practices that would serve as the foundation for future projects. Such a positive feedback loop would create a wealth of knowledge and make the most of our efforts. IYL 2015 is a testament to the key role that light continues to play in our lives. From being a subject of enquiry to contributing to scientific enlightenment and driving development, it has now come full circle. Clichéd though it may be, Astronomy still has the power to light up our lives. Ramasamy Venugopal was a visiting fellow at the Office of Astronomy for Development from Feb-May 2015. He worked on University-level projects at the OAD. He is an engineer interested in Astronomy and Space and passionate about science communication, outreach and science for development.